Isn’t that a lovely flower arrangement? Well, ehem, yes it is but I’m not planning on enjoying the view of the tissue paper softness of those brilliant buds for long…because I’m going to eat them! I would like to introduce you to someone special. Someone whose visits I eagerly await each summer. Meet Zucchini Flower! If you’ve already met, congratulations! You are most well aware of the utter deliciousness unleashed by the delicate flowers of the zucchini plant. If you haven’t, just wait. You are about to have a new BFF. I usually make about 4 zucchini flowers per person (although honestly I bet everyone would eat double that if they could). They are sometimes sold in the clear, plastic clamshell containers (similar to what strawberries come in) and sometimes sold like flowers, soaking in a vase of water. Also, sometimes small zucchini are attached and sometimes not. If they come straight from your garden, then you don’t have to worry about how they are sold! The vinaigrette makes more than enough and is fantastic on mixed greens, drizzled over fresh mozzarella, or tossed with pasta. Whisk the egg white until white and frothy. Whisk in beer, followed by flour and salt. It should be the consistency of pancake batter. Stir all ingredients together. Spoon into a zip-top bag. Cut about 1/4 inch off of the tip of one of the bottom corners. This sort of makes a pastry bag. It works. Add all ingredients except olive oil to a blender or food processor. Process for 1 minute, until smooth. Slowly drizzle in olive oil. Remove the zucchini from the zucchini flowers if attached. Leaving the stem in tact, quarter the zucchini up to the stem lengthwise so that the pieces fan out slightly. Gently open the zucchini flower. There may be a protrusion inside the zucchini flower at the base. This is the, um, oh, freshman biology was so long ago…pistol…stamen…anyway, gently pull that out and rinse the inside of the zucchini flower. Open the petals and squeeze about 1 Tablespoon of the filling into the flower. Meanwhile, preheat about 1 inch of vegetable in a large skillet. I drop a little batter in the oil to see if it is hot enough. If the batter immediately sizzles, you’re good to go. 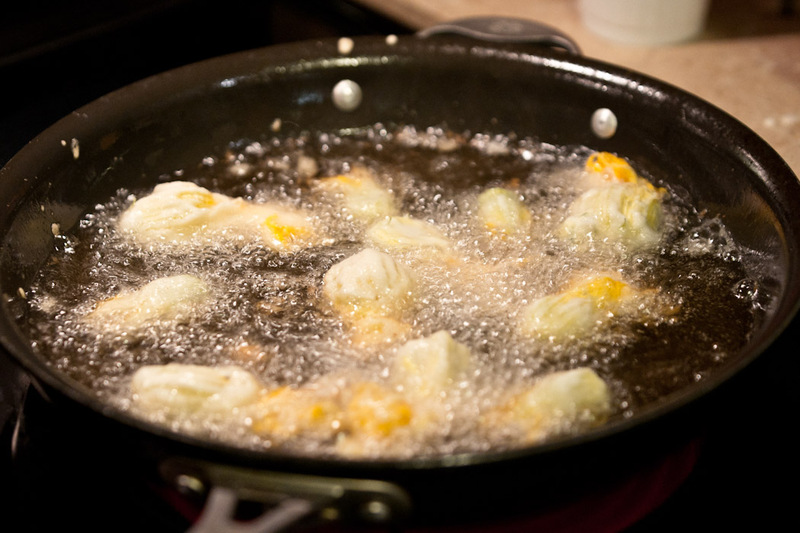 Dunk the stuffed flowers in the batter and place in the oil. Cook for 1 minute and flip, using a slotted spoon. Cook for another 30 seconds to 1 minute until golden. Remove from oil onto a paper towel lined plate. Sprinkle lightly with salt. 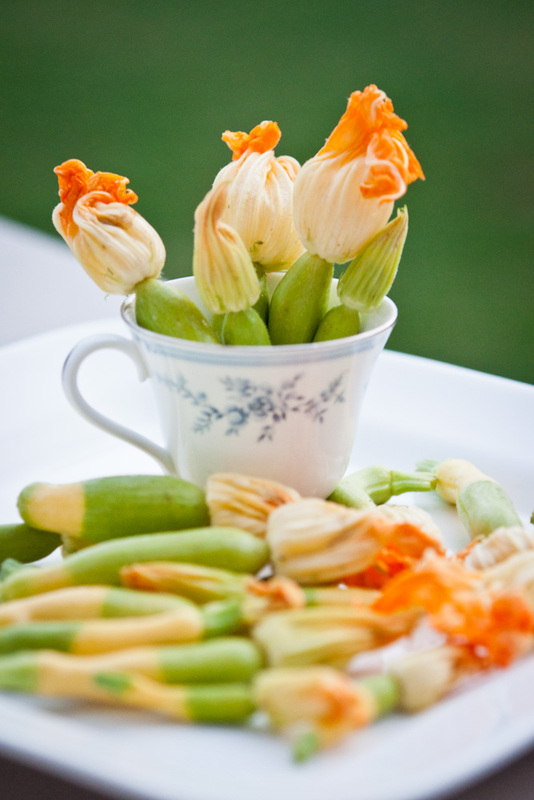 If you are using the tiny zucchini that you removed from the flowers, repeat the same process. I’ve served this a couple of ways. As you see above, tossed on a plate with a bowl of golden goodness in the middle. I’ve also served the fried flowers on a bed of arugula, drizzled with vinaigrette. It’s awesome either way.